Latest Western fabrication attempts to portray "moderate rebels" locked in combat with hordes of Al Qaeda militants as ploy to justify further arming of terrorists and even direct intervention along Syria's borders. September 20, 2013 (Tony Cartalucci) - Stopped short of direct military intervention by Syrian-Russian geopolitical maneuvering, the West has attempted to retrench their agenda of subverting Syria in a variety of ways. It was reported that the US is now officially arming terrorists inside of Syria after years of semi-covertly passing them thousands of tons of weapons at a time and billions in cash directly and indirectly through Saudi Arabia, Turkey, Jordan, and Qatar. The goal, in part, is to sabotage any attempted UN incursion into Syria to verify and disarm Syria's chemical weapons, then use the UN's failure as justification for direct military intervention. 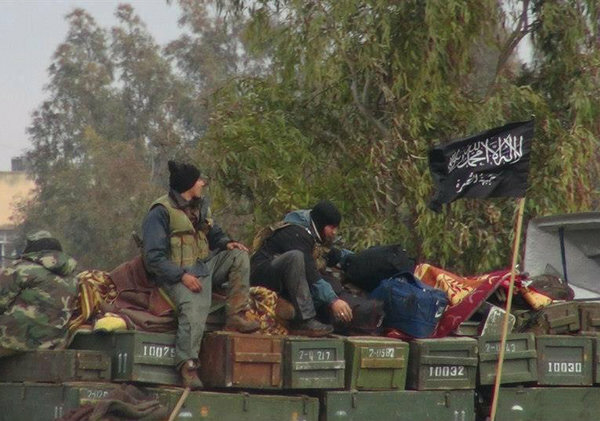 Image: (Edlib News Network Enn, via Associated Press) Al Qaeda terrorists in Idlib, Syria. It is now admitted by the New York Times that the entire armed so-called "opposition" is comprised entirely of Al Qaeda, meaning the torrent of cash and weapons sent to the "opposition" by the West and its regional allies, were intentionally sent directly to listed terrorists guilty of a multitude of unprecedented atrocities. Additionally, a new narrative is taking shape as the Syrian government stands poised to restore order across its war-ravaged nation. The West is claiming that the "moderate" fighters it has been sponsoring since 2011 are locked in combat with Al Qaeda terrorists across the country, even after numerous attempts to claim Al Qaeda was not even present inside of Syria, or present but in insignificant numbers. Extremist groups make up between 15% and 25% of the rebels fighting Syrian leader Bashar Assad, but moderate forces are growing stronger as a result of support from regional allies, Secretary of State John Kerry told Congress on Wednesday. "I just don't agree that a majority are al-Qaeda and the bad guys," Kerry said in testimony before the House Foreign Affairs Committee. "That's not true." Al-Qaeda-linked militants seized a key northern Syrian town from rebels on Wednesday, as mounting friction between anti-­government extremists and more moderate, Western-backed opposition factions erupted into all-out conflict. “There is a huge expansion of the Islamic State in Iraq and the Levant,” said Col. Malik al-Kurdi, a senior commander in the Free Syrian Army, who said the extremists had also recently seized the town of Kafarnaje. With Islamic State well-financed and armed, “the FSA power is in reversal,” he said. But if the so-called "Free Syrian Army" (FSA) is being funded, armed, trained, and otherwise supported with the combined resources of the United States, the United Kingdom, France, Saudi Arabia, Qatar, NATO-member Turkey, Jordan, Israel, and others, just how exactly is the "Islamic State," and other extremist factions such as Al Qaeda's Syrian franchise, Al Nusra, getting even more cash and weapons? The answer, as will be explained further in documented detail below, is that there were never, nor are there any "moderates" operating in Syria. The West has intentionally armed and funded Al Qaeda and other sectarian extremists since as early as 2007 in preparation for an engineered sectarian bloodbath serving US-Saudi-Israeli interests. This latest bid to portray the terrorists operating along and within Syria's borders as "divided" along extremists/moderate lines is a ploy to justify the continued flow of Western cash and arms into Syria to perpetuate the conflict, as well as create conditions along Syria's borders with which Western partners, Israel, Jordan, and Turkey, can justify direct military intervention. There aren't, nor were there ever "moderates" fighting in Syria. The US State Department has admitted Al Qaeda is the prominent fighting force in Syria. The State Department admits that from the very beginning, Al Qaeda has been carrying out hundreds of attacks in every major city in Syria. Clearly for those who read the 2007 Hersh piece in the New Yorker, and then witnessed the rise of Al Qaeda in Syria, the explanation is quite simple - the West intentionally and systematically funded and armed Al Qaeda to gain a foothold in Syria, then overthrow the Syrian government in an unprecedented sectarian bloodbath and subsequent humanitarian catastrophe, just as was planned years ago. If the US & its allies are funding "moderates," who is funding Al Qaeda? (The US). However, now, according to Western leaders, the public is expected to believe that despite the US, UK, France, Saudi Arabia, Qatar, Jordan, and Turkey flooding Syria with billion in cash, and thousands of tons of weapons, all sent exclusively to "secular moderates," somehow, Al Qaeda has still managed to gain preeminence amongst the "opposition." How can this be? If a 7-nation axis is arraying the summation of its resources in the region behind "secular moderates," who then is arraying even more resources behind Al Qaeda? The answer is simple. There never were any "secular moderates," a fact the New York Times has now fully admitted. To "secure regular arms supplies" from whom? According to the West, they have been supplying "mainstream rebel groups" with billions in cash, and thousands of tons of weaponry - and now according to the BBC, training as well. Where if not intentionally and directly into the hands of al-Nusra, did all of this cash, these weapons, and training go? Not only is the Syrian government fighting now openly admitted Al Qaeda terrorists, but terrorists that are not even of Syrian origin. This last point, "and distribute flour to keep the city's bakeries running," is of extreme importance, because that "flour" they are "distributing" comes admittedly, directly from the United State of America. Clearly, the puzzle is now complete. Indeed Mr. Mohammed Fouad Waisi was correct, Jabhat al-Nusra, a listed terrorist organization by the US State Department, is supplying the people with flour - flour it receives by the ton directly and intentionally from the United States in direct contradiction to its own anti-terror laws, international laws, and the US State Department's own frequent denials that it is bolstering terrorists inside of Syria. Clearly the US and its allies are propping up terrorism, and more alarming is that the "aid" they have been providing the Syrian people, appears to have been used as a political weapon by Al Qaeda, allowing them to take, hold, and permanently subjugate territory inside Syria. It should be noted again, that the New York Times itself admits that the ranks of al-Nusra are filled with foreign, not Syrian, fighters. US narrative aims at "saving" non-existent "moderates" from the Al Qaeda terrorists they themselves are intentionally arming. Revealed is a conspiracy so insidious, so outrageous, and a web of lies so tangled, that Western governments perhaps count on their populations to disbelieve their tax money is being used to intentionally fund and arm savage terrorism while purposefully fueling a sectarian bloodbath whose death toll is sounded daily by the very people driving it up to astronomical heights. The cards are down - the US has been exposed as openly funding, arming, and supplying Al Qaeda in Syria for over two years and in turn, is directly responsible for the death, atrocities, and humanitarian disasters within and along Syria's borders that have resulted. While the US attempts to sell military intervention on behalf of Al Qaeda in Syria, using the flimsy, yet familiar pretext of "chemical weapons," it appears that before even one American boot officially touches Syrian soil, an already horrific crime against humanity of historic proportions has been committed by the US and its allies against the Syrian people. This is a crime against humanity the West intends to fully compound with its new narrative of "moderates" fighting Al Qaeda. The goal is to justify the continued torrent of cash and weapons into Syria to fuel the conflict and perhaps to have "safe zones" imposed across Syria's borders under the guise of "running out" Al Qaeda. Of course, Al Qaeda will continue to be armed and funded by the very interests "running them out" deeper and deeper into Syria. It is important to understand two undeniable, verified facts. First, there are no moderates in Syria, and second, Al Qaeda's ascendance in Syria is the direct results of the West intentionally arming them, funding them, training them, providing them with tactical, logistical, and strategic support, as well as financing them through the purchase of Al Qaeda-controlled oil fields. Understanding these facts lifts the veil regarding the latest round of lies and fabrications by the West to regain the initiative amidst their premeditated, 2-plus year assault on Syria.